Tools and tweaks to make the lives of players seeking achievements a little bit easier. Overachiever is highly configurable and has many features, many (but not all) of which are listed below. Most features can be disabled and/or tweaked. Options can be found using the /oa command or at Interface Options -> AddOns tab -> Overachiever. Suggestions: Get suggested achievements based on your current location, active holiday events, etc. Watch: Create custom watch lists of achievements. Related: See how achievements relate to each other. 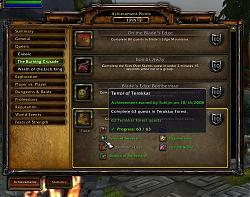 Tooltip and audio reminders for objectives you find in the world (and in your bags). Automatically track exploration achievements as you travel. Automatically track timed achievements when the timer starts. Compare progress using chat links: Display your progress below that of the player who linked the achievement. Ctrl+click on an achievement link to open the GUI to that achievement. Ctrl+click again to track it. Draggable Frames: The achievement frame is draggable. New tabs added to the default achievement frame, as highlighted above. Display icons next to recipes you need to cook for "The Northrend Gourmet", "The Legion Menu", and similar achievements. Ctrl+click on one of these recipes to open the UI to the achievement that requires it. ''Part of a series'': Give the names of other achievements in the series and its relation to them. ''Required by'': Give the names of any meta-achievements that list this achievement as a criteria. Meta-criteria (achievements displayed as the criteria for obtaining a larger achievement) in the GUI use a detailed achievement tooltip instead of simply giving the date the criteria was completed (or nothing if it isn't complete). "To All The Squirrels I've Loved Before", "To All The Squirrels Who Shared My Life": Do I need to /love this critter? "Pest Control": Have I exterminated this critter? "Well Read", "Higher Learning": Have I read this book? 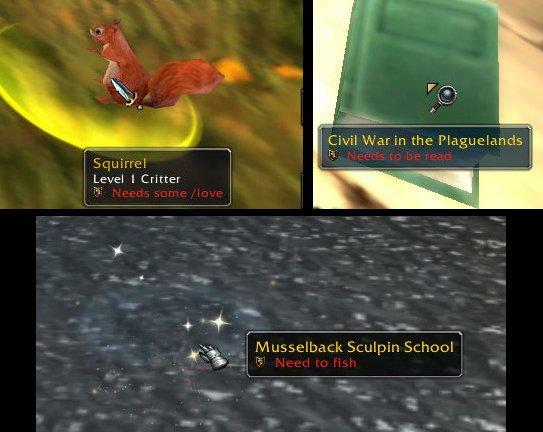 "The Scavenger," "Outland Angler," "Northrend Angler": Have I fished this type of node? "It's Happy Hour Somewhere", "Tastes Like Chicken": Have I consumed this food or drink? "Let It Snow": Do I need to use a Handful of Snowflakes on this player? "Fistful of Love": Do I need to use a Handful of Rose Petals on this player? "Shake Your Bunny-Maker": Do I need to use Spring Flowers on this player? Sound Reminder: Choose a sound to play when one of the above tooltip reminders shows up if you need to do something. You can associate key bindings with each of the new tabs added to the Achievement frame using the standard key binding interface. The new bindings are located under the heading "Overachiever." Localized to one degree or another for English, Spanish, German, French, Italian, Korean, Portuguese, Russian, simplified Chinese, and traditional Chinese. Translations generously provided by your fellow overachievers. Some of Overachiever's features are implemented using modules, namely Overachiever_Tabs and Overachiever_Trade. Modules have their own folders that should be placed inside the Interface\AddOns folder alongside Overachiever. They can be enabled or disabled as you would a separate addon. Additionally, the individual tabs of the Tabs module (Search, Suggestions, Watch, Related) can be disabled by deleting or renaming the corresponding .lua files (Search.lua, Suggestions.lua, etc.). This is a one-man project that can be quite time-consuming, depending on Blizzard's whims. All donations of any size are appreciated. - Updated for WoW patch 8.1. - "Eat Your Greens" (new): Added an option to display a reminder tooltip for eating plants in Nazmir. -- Added suggestions for the Battle for Stromgarde warfront. -- Added suggestions for the dungeons Freehold, Shrine of the Storm, Waycrest Manor, Siege of Boralus, Atal'Dazar, The MOTHERLODE! !, The Underrot, Temple of Sethraliss, and Kings' Rest. -- Added more suggestions for Tol Dagor (dungeon). - Battle for Azeroth's "Adventurer of..." achievements: Added "need to kill" reminders for the criteria that needed manual entry of mob IDs. - "To All the Squirrels..." achievements: Fix reminder tooltip not showing for certain critters that aren't / are no longer technically classed as critters (such as the sheep in Elwynn Forest). 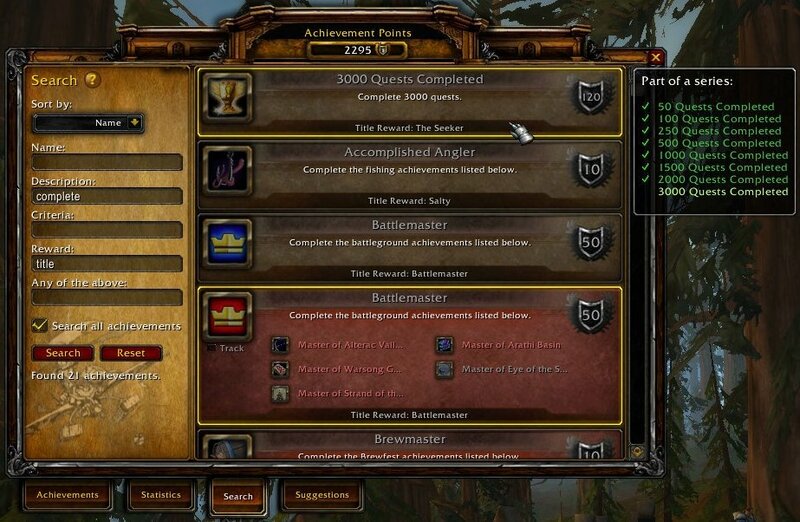 - Attempt to make the draggable achievement frame feature more compatible with other addons. -- If a recently spotted objective is complete, then its tooltip text is now colored green and will have a checkmark next to it. 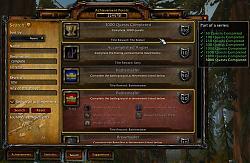 -- "Azeroth at War..." achievements: Missions can now be flagged as recently spotted objectives. -- Fixed an issue where reminders triggered by a timer resulted in a tooltip indicating recently spotted objectives but with none listed. - "Azeroth at War: The Barrens", "Azeroth at War: After Lordaeron", "Azeroth at War: Kalimdor on Fire" (new): Added an option to display a reminder tooltip in the mission UI for completing missions. 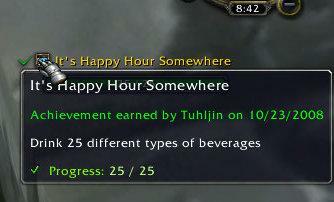 - "Three Sheets to the Wind" (new): Added an option to display a reminder tooltip for acquiring drinks. -- Added suggestions for Tol Dagor (dungeon) and the War Campaign Ships (Banshee's Wail and Wind's Redemption). -- Removed suggestions that are now Feats of Strength. - Fixed an issue where tooltips indicating whether an item needs to be consumed would appear even when the related option's checkbox was unchecked. 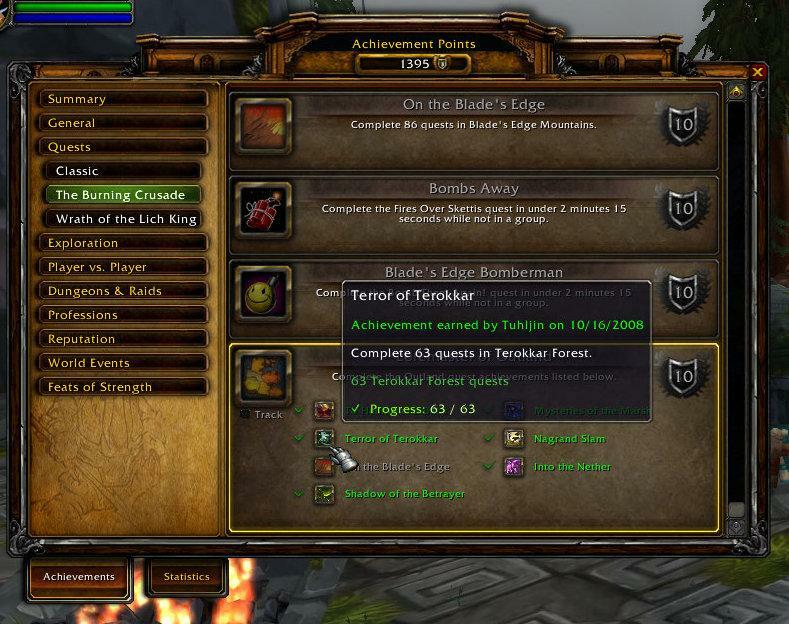 - Fixed reminder tooltip not showing for some mobs required for Legion's "Adventurer of..." achievements. - Trade module: "The Kul Tiran Menu" or "The Zandalari Menu" is now considered when determining if you need to cook a recipe. - Fixed an issue where some of the opposing faction's achievements were sometimes automatically tracked in battlegrounds. -- This module now improves the accuracy of cross-faction data. For instance, the meta-achievement "Master of Warsong Gulch" requires a different version of "Quick Cap" for each faction. Without the cache module, only the "Quick Cap" for your own faction indicates that it is required by another achievement. With Overachiever_Cache enabled, both versions now indicate this. -- The tooltip indicating an achievement is required for a meta-achievement can now display an Alliance or Horde icon to show when the cache indicates the requirement is exclusive to one faction. -- Fixed an issue where populating the cache while logged into a character of one faction prevented data from the other faction from being added. - Correct an issue that prevents the cache module from being loaded. - Trade module: Fix achievement information not showing in Cooking window. -- Added numerous suggestions for Battle for Azeroth zones. -- Add more suggestions to the Draenor garrison. -- Suggest "Chromie Homie" at Wyrmrest Temple in Dragonblight (instead of only when actually inside The Deaths of Chromie scenario). - Added achievements for Battle for Azeroth zones to exploration auto-tracking. - Updated for Battle for Azeroth beta and pre-patch, WoW patch 8.0.x. Updated TOC and made many required changes. - Reworked the achievement search system. Searches should generally take less time and they now allow other activity to continue during a search. -- Added an option to direct searches started by slash commands (like "/ach") to the Search tab. - Minimap tooltips are now properly supported by the tooltip reminders feature. Up/down arrows (indicating a node's relative vertical position) do not prevent the reminder from showing and multiple nodes showing in the tooltip at once are now handled. 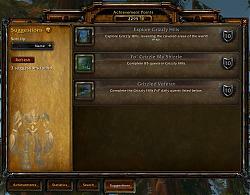 - Suggestions Tab: Added suggestions for Seething Shore. - Tabs module: Added text overlay to indicate when the achievement completion filter (earned or incomplete) has caused an achievement to be omitted from the Suggestions or Related tabs. - Improved ability to toggle tracking an achievement by ctrl+clicking on its link. Overachiever will now attempt to toggle tracking when the selected achievement is part of a series to which the linked achievement belongs (rather than requiring the linked achievement itself to be selected). - Option "Startup: Throttle achievement lookup" is now disabled by default and it is automatically disabled for users upgrading from a pre-1.0 version of Overachiever. Addon makes the game lag. When I log in to the game the first time the overachiever addon seems not to work properly on the big map (it works normally on an area but when I zoom out to Eastern Kingdoms, for example, the game starts to lag badly) the only way I found how to avoid that is to reload the addon. Does anyone else have the same problem or it is just me? the9thresident: Thanks for letting me know. PayPal must have changed something. It should work properly now. Will this be updated for Legion? Haven't seen this one posted yet and I keep getting it every time I change zones. I have the latest version. I just got the 500 Draenic Seed achievement. 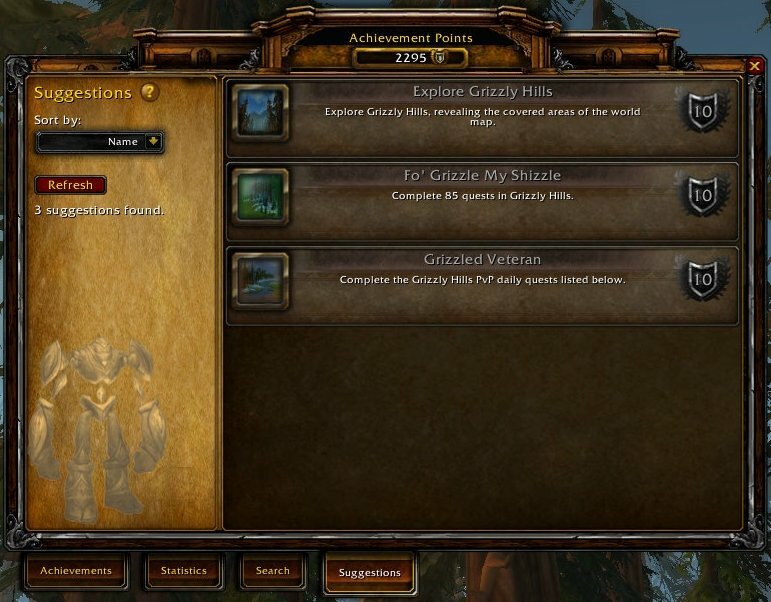 When I clicked on it to see what it did, the achievement window opened up, on the left nav bar the Professions line was highlighted, and in the main window all the achievements were For The Alliance! and highlighted as if I've done it. (Which I haven't.) Also, there was no other text in the achievement bar. I closed it, and opened it via the Y hotkey, and it was normal. No error popped. I took a screen shot if you'd like me to put it up on imgur so you can see it. Any chance of getting the update posted here? FYI, a new version was released on Curse. I'm away from home and so can't easily upload it here at the moment but it should be here in a couple of days. Last edited by Tuhljin : 11-26-14 at 11:06 PM.